A Cinematic Ode to Shanghai's Vanishing World Shanghai has a population of almost 18 million, but only 632 protected historic sites. Its distinctive traditional architecture is rapidly disappearing, and along with it, a way of life. A local filmmaker has produced an ode to these vanishing neighborhoods. A look at how Shanghai is preparing for its future. 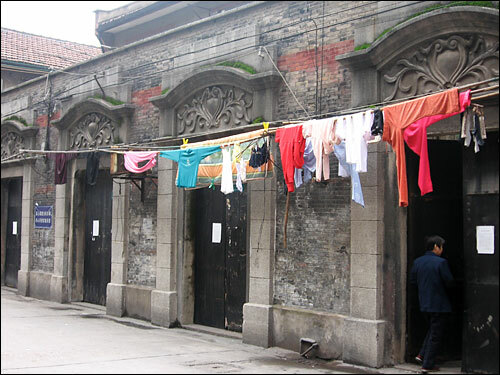 The lanehouses of Dazhongli are a type found primarily in Shanghai. They combine decorative European touches, such as the carved stone doorways outside, with a Chinese room-layout inside. 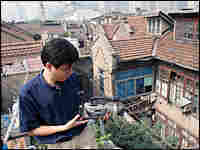 Shu films his old neighborhood from a rooftop. In China, Shanghai's role is as a paragon of modernity, and also as a harbinger of the future. China is now undergoing one of the most massive urbanizations in human history, and nowhere is that more evident than in Shanghai. The city's population is now almost 18 million, and is forecast to rise to 25 million by 2020. Louisa Lim has an overview of the city's past — and how it's preparing for its future. Shu stands outside the door of the house where he grew up. 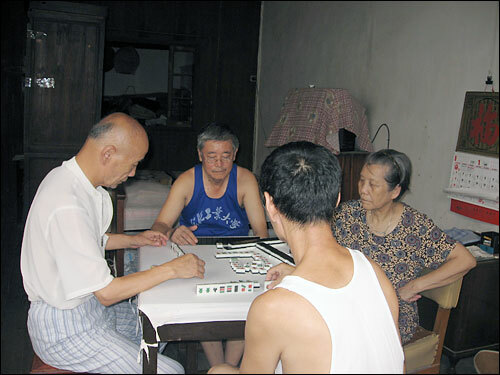 Neighbors play mahjong in Shu's grandmother's room. Shu no longer lives in Dazhongli. 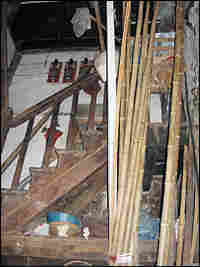 The traditional lanehouses feature communal staircases. 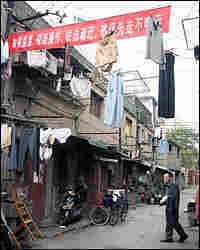 Red banners encouraging residents to move out as soon as possible festoon the alleys. 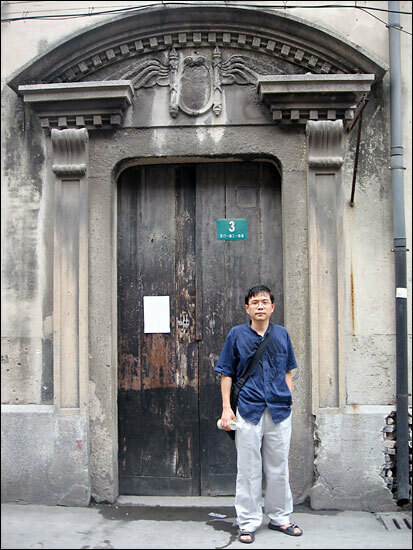 Despite its population of almost 18 million, Shanghai only has 632 protected historic sites. 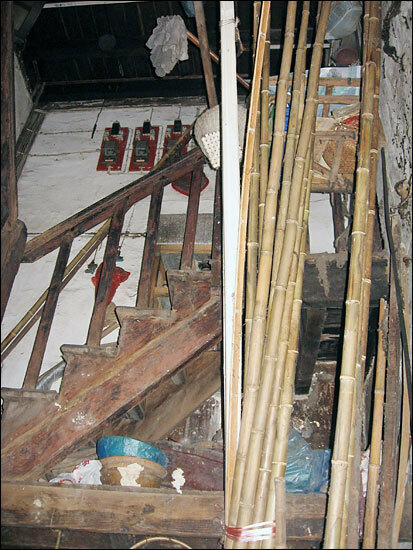 Its distinctive traditional architecture is rapidly disappearing, and along with it, a way of life. The warren of alleys and the layout of traditional houses — with their communal kitchens — all created a unique sense of community. "There's such close contact between people, everyone helps each other," says local filmmaker Shu Haolun, 34. "This lifestyle is becoming more and more rare, and I miss that." Shu has produced an ode to this vanishing world. He starts his documentary, Nostalgia, with his reasons for making it: Soon, I'll only be able to see our alleyway in old photos, and in this film, he says. Walking around his old neighborhood is like stepping into his documentary. 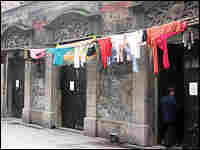 Neighbors exchange greetings and chat as they wash clothes in concrete basins in the alleyway. Imposing, carved-stone pillars and arches frame the tall, wood doorways of the gray, three-story buildings. The buildings are shabby, their facades patched and stained by the passage of history. And soon, this tight-knit community will be dispersed. 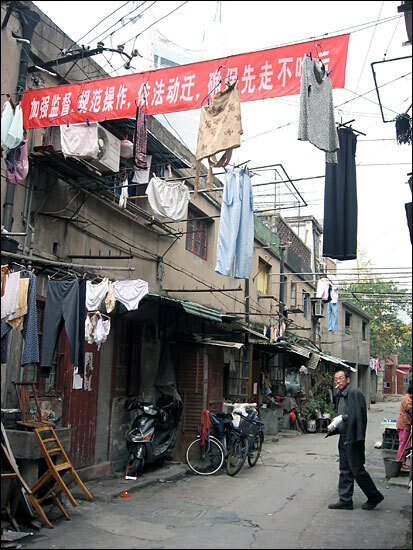 In April, residents of this neighborhood, known as Dazhongli, received notice that their houses will be demolished. No one knows when, but everyone realizes it will be soon. Shu's film depicts an idyllic childhood, despite hardships. Eight families lived in his house; six people and a cat lived in his family's one room. But no one knew any other way of life, and there were countless playmates, and surrogate parents and grandparents. In Nostalgia, Shu charts the minutiae of growing up — buying sweets in triangular packets from the local shop, being late for school, his first romance — as his grandmother played a seemingly endless game of mahjong. 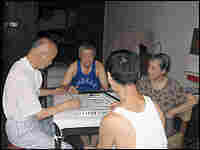 During a recent visit, his grandmother's neighbors are using her house for mahjong. But she's in the hospital, recovering from a broken leg. Her neighbors view the future with sadness. "We don't want to move out, but several hundred households have already gone," says Cheng Yuxian, who has lived in the neighborhood for more than 40 years. 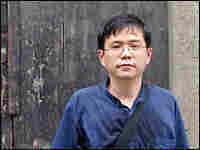 But they will sign a compensation agreement in the end, laments Zhu Junbiao. They say that the developers aren't offering enough money by way of compensation — not enough to buy a house, even in a suburb 25 miles from the city center where they now live. In his film, Shu's grandma recounts the story of another neighbor. After he moved out, his memory worsened and he couldn't remember the address of his new apartment in a high-rise tower. He often turned up on the doorstep of his old house, disoriented and confused. 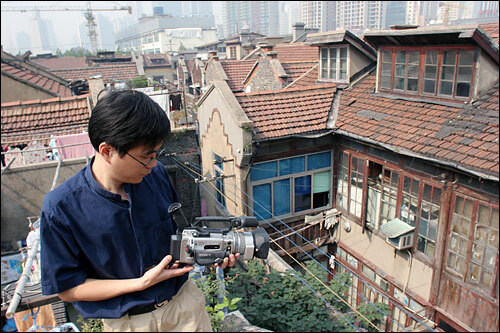 Filmmaker Shu says rapid urban development is creating a collective sense of loss. The places of our childhood "simply don't exist any more," Shu says. "They've become newly developed zones. It's not just a material loss, it's a spiritual loss. It's not just that we've lost our houses. We no longer feel that home exists." The transformation is so complete that Shu believes China is facing an identity crisis. "We talk about having 5,000 years of Chinese history, but wherever you go, you see demolition," he says. "There are construction sites everywhere. There isn't even 50 years of history left." Some are not ready to embrace that change. In the film, the self-appointed guardian of Shu's community was the street sweeper, who sat at the entrance to the alley for most of the day, watching life go by. It's a sign of the political sensitivity of demolishing an entire neighborhood that he's been replaced by policemen, sitting at the same spot, watching for unrest from those who were once so happy.